Site: Stevia plants like a rich loamy soil and it must get about 3-4 hours of sunlight per day. Their feeder roots are near the surface, it is best to ad compost for extra nutrients if your soil is sandy. Stevia roots are sensitive to excessive moisture. Be careful when watering and make sure their soil drains easily. Frequent light watering is best during the summer months. 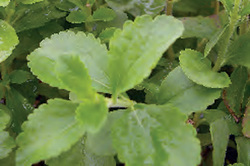 Growing: Young Stevia plants are sensitive to low temperatures, so you should wait until any chance of frost has past and soil temperatures are 50 to 60 degrees F. before transplanting them into to your herb garden. Plant 18 to 24 inches apart. This plant will grow to about 1 - 2 feet high and wide. You can also grow Stevia indoors. Hydroponics systems work well or a 10 to 12 inch container filled with a light weight growing mix. Add some much around the top for the swallow roots. Harvesting: To harvest Stevia, cut off the tips of the branches about a third of the way down. The branches will have new growth at that point which will make it grow fuller.